Gracie with her toothfairy gift! Cats are like people, all are different. I have four and no two are alike. Not even close. Gracie is new to the group. She’s been here since January and I’m still trying to figure her out. She’s not as flashy and “me, me, me” as Morgan but she’s not a shy one either. She’s been through a lot in the past few months, losing an eye and a load of kittens, getting spayed and now dental surgery. Her past is hazy. She was rescued from a hoarding situation. She was very socialized but a weird eater. More on that later. After her dental surgery which included multiple extractions (possibly cause by poor nutrition), she seemed to rebound fast, then dipped. She was on pain meds and I think they were instrumental in making her groggy and not hungry. She was lucid enough to give the really sad puppy eyes (yes cats do that too) while lying in her bed. As my heart was being ripped apart, I set a deadline. If she wasn’t much better by Tuesday, she’d go to the vet. I stopped the pain meds and overnight she bounced back. Her first act of health was to wake us at 3:30 a.m. to play. “If you don’t want to play, I’ll just chew on your fingers and toes!” How can you get mad at that? She did have a visit from the tooth fairy! 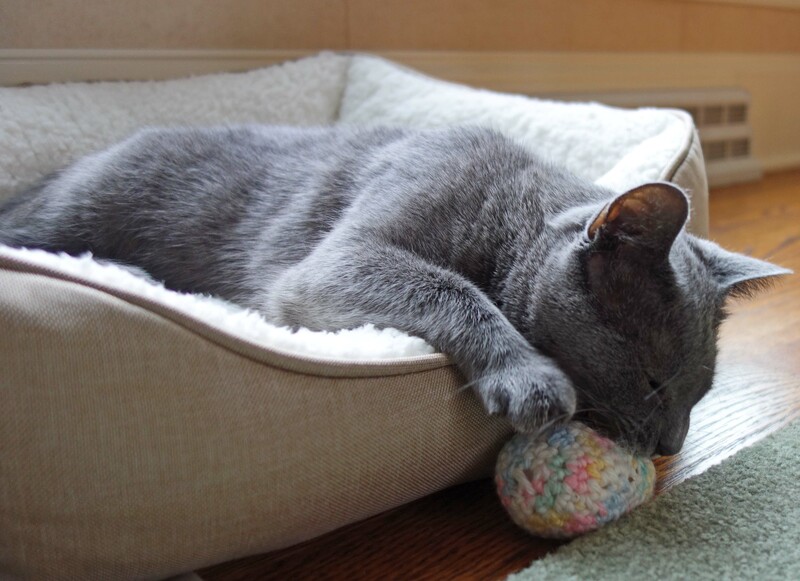 Ellen from 15andmeowing.com sent some fabulous crocheted catnip toys. They are soft. They quickly became the favorite. (Maybe they had magic too!) A thank you shout out to Ellen! Here are a few things I scratch my head about. Prior to this past episode, the vet wanted me to get Gracie on a soft cat food diet for health reasons. No can do. I went through brand after brand, with gravy, without gravy, mush, filets. I tried expensive brands, cheap brands, warmed up, cold, room temperature, water added to hard kibble and all flavors including stinky. I resorted to rotisserie chicken. Nada. I don’t know what she would like to eat. Right now she’ll only eat hard kibble but she’s looking for something. Perhaps this was customary at her former home. Kibble and garbage scraps. She did eat cheese…once! Calling all cat owners, any suggestions? Author’s note: After I set this up for publication, I figured it out…sorta. She was fed table scraps. She smelled a pork chop and insisted she get some. She stole the bone from the garbage and the 7 pound dynamo ran with it through the house with me after her. The beloved husband caught her. (No picture of that Keystone Kops event.) Then she ate some boiled ham lunch meat. I have to get her back on cat food. This entry was posted in Cat Adoption, For Animal Lovers Only, Humor, Sassy cats and tagged animals, cat behavior, cat dental surgery, cat foods, cats, coniving cats!, foods cats like, Gracie, pets by Kate Crimmins. Bookmark the permalink. I’m late to the party on this one, but did anyone suggest baby food (jar), chicken, turkey or beef? Watch out for onions in it, though. This is a good intro to canned cat food. Good luck. Keep us posted! p.s. I’m with ya on Walmart. I don’t do it either. Someone did suggest it and I tried but she wouldn’t eat it. Within a few days something happened. She wouldn’t eat hard kibble anymore, only soft. We started with real chicken, small amounts. We moved to a teaspoon of chicken cat food mixed with the real chicken. Slowly I’ve been able to wean her. There are a few cat foods that she will eat (all chicken or turkey) without real chicken on top. For some others like chicken or turkey mixed with tuna or cheese, she still needs the real chicken pieces on top. She won’t eat any feast or mashed food, just food that looks like pieces. It’s been a real ride. She is now eating about 9 ounces of wet cat food a day. She’s very active and seems to be doing well. Poor thing! It almost sounds more like she wants the hunt and discovery of sneaking table scraps. I don’t suppose you’re interested in putting her food on your plate? Probably not. I’m such a push-over I’m afraid I’d be eating beans and giving the cat some steak! I’m a bad example…stay the course! It’s been a roller coaster ride since I posted this. I got her to eat cooked chicken. Then I started incorporating small bits of chicken cat food in it. (Cooked chicken does not have all the nutrients she needs.) All was going well but yesterday she started throwing up all the food she ate. We are back at square one. She ate a very small amount of cooked chicken but will not touch it if it has the cat food mixed in. Sigh! Oh gosh, she’s one incredibly picky eater! Sounds like you’ve pretty much tried everything. Luckily our cats aren’t into human food so we don’t have to guard our plates. I thought I had it almost fixed. She was eating half real chicken and half chicken cat food. Yesterday and today she threw up everything she ate. Sigh! Good luck with Gracie . . . our first two cats loved table scraps (before we switched to a vegetarian diet) and wouldn’t leave us in peace if we were eating LOBSTER! That’s another reason I don’t want her to eat people food — begging at the table. At the end, I would give Jake a bite but that’s all he wanted. He was annoying if we had pizza because he was sure we were holding out on him! He only ate meat. No interest in bread or tomato sauce (unlike his owner). My mom has been forwarding your posts. You have a cat insight. Betty Ehrets is my godmother. I’ve read your predicament about Gracie and have an idea. Catnip grows wild in many places around PA. Might I suggest that you find fresh catnip, put it through a blender and mix some of it in with moist cat food. If it works, you could transplant some to your back yard and have a catnip patch for your “fur babies”. Thanks for stopping by. We have a lot of it in our yard. (It’s a hazard of having cats!) Gracie does love her catnip. I don’t know if you can find it fresh now but that’s a good idea! What we don’t do for our fur babies. If she was in a hoarder house, I have no doubt she was eating people scraps. I have no answers on where to go with that situation, but I did laugh at the image of her running with a porkchop bone..lol. I’m giving her chicken mixed with chicken cat food and she diligently works to eat the chicken first. Obviously chicken cat food does not taste like real chicken. Who knew? This is why I want to be your cat! I think you would hold out for lobster! The obvious thing to do is to soak the hard kibble till soft, mold it to look like table scraps and re-dry. At feeding time throw Gracie’s food into the garbage and let her find it. That’s not really a bad idea! Maybe I should buy her a dog bone. Frankie was a street cat and has a severe case of gingivitus… had a few teeth removed but the vet wanted to do a full mouth extraction…. I said no. It’s an auto-immune disease. I have two of my cats (feral and street) on L-lysene. Pharoah because of his auto-immune eye problem, Frankie because of the teeth. I also have Frankie on a very low dose of Plaque Off for Cats which I buy from Amazon and shipped from England. He doesn’t like the US version for Dogs and Cats which is about 1/3 the price…. of course! But it has saved his teeth. And the L-lysene saved P’s eye. Just my two cents.. Thanks. I am concerned about her nutrition. She doesn’t have strength in her legs to jump. She probably has rickets! Cats in the wild eat prey which is a balanced diet for them. I need to investigate supplements if she doesn’t broaden her eating pattern. I’m interested in the Plaque off for all my cats. Only Morgan hasn’t had dental work yet. Seems to me canned mice would be more appropriate than canned beef for cats! Only problem with the Plaque Off is it can’t be given to felines with a tendency for hyperthyroidism which seems to be common with older cats. Yes canned mice or birds would work. In the Philippines, we feed cats and dogs people’s food, whatever we eat, we feed them. No such thing as special food for cat. If this is what Gracie accustomed to, best to give her some of your food but be mindful of spices. Surely you can google which ones are bad for the cats. Stay away from pain meds, it makes the cat not want to eat. I wish my cats were trained to eat my own cooking. I expect that cats in the Philippines are allowed to free roam and also eat prey which helps round out their diet. Gracie has many malnutrition issues from her previous diet that I’m trying to correct. A few mice here and there would have kept her more healthy. Your cats (I thought you were down to one cat now) are healthy and that’s all that counts. Do you have a Walmart nearby? They carry their own brand called PURE BALANCE and when I’ve had ill or finicky cats, they would eat the Tuna and Shrimp or the Chicken and Beef; There are two types, tubs and small 2 oz cans. The tubs do not appeal, but the 2 oz cans are always a hit. Walmart also carries pouches called Delectables (lickable treats) in various flavors and my finicky cats love them. These pouches are put out by Hartz and are different from some of the other, more expensive pouches. It sounds like Gracie got used to having meat scraps and prefers that to everything else, even flaked fish!! You have to be so careful that she doesn’t get a bone shard somehow when she is scavenging the trash. If you don’t have a Walmart nearby, or if they don’t carry the little 2 oz cans or the pouches (and sometimes they run out and you have to wait for more to come in), let me know and I will send you a few to try out. The Delectables come in flavors for 10 year plus cats, and also 15 year plus cats. We do have a nearby Walmart and I will try that. I’ll try most anything these days just to get her to eat. Will do! You will probably hear me shouting from the rooftop! I am glad that Gracie is now feeling better and running through your home. Your patience, focus and persistence is so commendable! Especially since I’m not a patient person. Cats bring out the good in me! That seems to have changed almost overnight. Now she won’t eat hard (I think it was bothering her mouth with the dental surgery). Won’t eat hard and won’t eat standard cat food. Can’t feed her steak! Working with cooked chicken (which she likes better than rotisserie) with some cat food worked in it. She is crafty. She tries to pick out the real chicken and leave the cat food behind. Overall I’m so glad she’s ok now and there aren’t any other health issues (I hope). Yes and the exasperation when what worked yesterday, doesn’t work today! Rudy, the cat I had during and after college, loved tuna fish. She could be upstairs in a lump under the bedspread, but when she heard that can opener, she’ll tore down the steps in a split second. Tuna didn’t work but I’m going to try again. My two love, love, love the water off of canned albacore, but barely touch the fish when I give it to them on their birthday and other special occasions. Good luck with Gracie and bless you for taking on the difficult task of helping an abused cat experience the best of life she’s missed out on till now. Tuna juice is one of the things my cats will “fight” over. They are very kind to each other and never steal food but when it’s tuna juice they try to squeeze in sideways to get a lick. My problem is I only use one can at a time and they aren’t into the tuna, just the juice. Exactly! Apparently there is a distinct sound when that type of can is opened because the kitty boys react to that sound and coming running from wherever they are in the house to get their share! Other cans being opened don’t get the same reaction. Tigger loved tuna juice . . . and he knew the sound of a can of tuna being opened vs. a can of garbanzo beans! I believe it. My cats come out of the woodwork or from a deep sleep on another floor. One of the well known brands has something called “Lickable Treat.” I think Friskies? Those go over well with my picky 18 year old. Might be something you can add to other food or use as a transitioning item. They have vitamins in them, I think. Is it wet or dry food? I don’t have any good suggestions, but I did want to wish you luck in getting her on the proper diet.. Thanks. I am hopeful today but she’s different every day. I wonder if it’s not the contents, but the presentation. Maybe she’d prefer to eat at the table? Or maybe she likes the thrill of the hunt, that is, stealing it from the trash. Can you combine people food with cat food and slowly alter the proportions over time? We are working on that. This is the first time I’ve seen her eat soft food. She likes the hunt for sure! Knocking over a garbage can that is bigger than her is a thrill for sure. Yep, used to scraps of human food, clearly. My street dog rescue, Fey, had the same thing about trash cans. Never mind that she got real food at home, she always made a beeline for trash cans! Maybe if you mix in steak scraps with the wet food, she’ll get used to it? Or bacon grease. Bacon grease is the easiest. I resisted bacon grease because of all the bad (yummy) stuff “they” say is in it. However, I was on a website that another commenter linked here and they suggest a tsp of bacon grease a day as a food enticer if necessary. Once a scraper always a scraper! She’s definitely a third world cat. Oops, I didn’t see itsathought2’s comment about catinfo! I just spent about 20 minutes on that website. Not sure if I want to make cat food but I got a lot of tips to make foods more enticing like parmesan cheese or a little bacon grease or grinding dry cat food to sprinkle on top. Stealing my scraps was the first time I saw her eat anything soft. The kibble was bothering her dental surgery as she would paw her jaw afterward. Big breakthrough this a.m. I mixed a tbsp. of commercial cat food in with the cooked chicken and it all went. Cats are like a box of chocolates. You never know what you’ll get. We all love our cats. Mine won’t eat tuna fish, what self-respecting cat doesn’t eat fish! I did have a cat once that would eat cooked turnip greens, she also had a taste for black eyed peas. I’m glad that Gracie is feeling a little better. I had one cat steal and eat a half dozen donuts that were in a bag on the counter. When I came home from work, the bag was shredded and there wasn’t a crumb left. She was just a kitten and fortunately she outgrew that. Tuna is a mixed bag here. Some love, some hate. Jake, my old cat now deceased was a huge tuna cat. I could get him to eat anything if it was hidden in stinky tuna. My cat (Reboot) likes buttered wheat toast. It took me a while to warm up to the taste of wheat toast, but she will drive me crazy untill I tear off several small pieces she can handle. In my house with this group, if it ain’t meat, they don’t eat. I think my next cat is going to be fed like this. I suspect that the foods we feed them contribute to the inevitable kidney dysfunctions. I would do it with Lily but she is th opposite of Gracie. She will not eat people food. Occasionally she steals it from me and drops it somewhere, but it is clearly just to get a rise from me. She won’t eat it. None of my other cats eat people food. I will check out this site (thanks for the link). I’ve always been reluctant because to make my own (although I do occasionally add cooked chicken into Hazel’s food to cut calories) my vet says that cat foods are fortified with the vitamins, etc. that cats need. They eat whole animals in the wild which insures they get enough taurine. My vet and some pet stores have a refrigerated section. I’ve never tried that food because Gracie wouldn’t eat soft foods. Now with her eating chicken maybe that’s an option too. Yeah. You have to add stuff to the food. It’s vets site. So she covers that. It’s definitely more work. Love the site! I got a lot of transitioning ideas now that she’s eating soft foods. My vet had given me some ideas but none of them worked. At least I have a few more to try. Who thought bacon grease would be acceptable! Gracie is a mystery through and through. And the photo of her is adorable. No suggestion about her eating preferences, you’re on your own with that one. We had a breakthrough this morning so I am hopeful (at least at this moment). She was on pain meds for this picture so she looked extra sad. Other than eating, she’s back to normal, racing around the house on her spindly legs! that’s interesting…. we had and have such a food odyssee with Phenny…he loves garbage and berd poop and he is a fan of lambs lettuce… all that things work fine for his 7 stomachs… just normal dog food give him the runs…. Dogs are more…umm…varied (as in weird) eaters than cats. I did have a cat that ate potato chips but only one. The only green thing my cats eat is grass. And heavens no vegetables! I was going to suggest that she was probably used to grabbing what she could find if she was in a hoarding situation. It may be more the method of eating (stealing) than the food itself that is her habit. It would be very interesting to see if she eats canned cat food if it is on the dining table…not a habit to encourage, but it would be interesting information. When you get desperate you try different things. My husband was astounded I let her eat the scraps from my dish! Although she ate hard kibble right after she came home from the dental surgery, she refuses to eat it now. She paws her back jaw so I think the kibble irritated her. Yesterday I cooked plain chicken and she ate a lot of it. Just this morning I was able to mix a tablespoon of chicken cat food in it and she ate it. First time she didn’t try to cover it. This will be an odyssey. People should not feed their pets table scraps! She drinks milk and I’ve been grateful for that as it’s some nourishment. Maybe I should put her food in the garbage can! Thanks for your suggestion. can you gradually mix in the kibble of your choice as you reduce the fat scraps? Maggie can be a picky eater, but smear a bit of cheese or even mix in a scrambled egg and she’ll eat her dinner. Unless of course we are going out, and then she will almost clear her bowl (must be a survival thing though she’s never been without food). Good luck! She stopped eating the kibble a couple days ago (about the same time she found the table scraps on my plate). I think it was bothering her surgical site. This morning she eat plain cooked chicken with a little chicken cat food mixed in. Up until now, that hasn’t worked because she wouldn’t eat anything soft. I am going to try egg. I’ve had some cats who ate it. I always try to stick to cat food but desperate times….well you know the rest. Hope Maggie slept through the night. I know the frustration of not being able to figure something out. Good luck.